Hidden Shoal Recordings is proud to announce the release of free single ‘Machines, Hawks and the Perfect Equation’ by San Franciscan slowcore trio Half Film. The track is lifted from their soon to be reissued sophomore album of 2000, The Road to the Crater. Hidden Shoal is lovingly reissuing Half Film’s two acclaimed albums – East of Monument (1998) and The Road to the Crater (2000) – as a double CD package on 31 October 2012. ‘Machines…’ distills the Half Film aesthetic into four minutes of shadowy, see-sawing guitar splendour. The song’s slowburn never yields an easy payoff, the tension becoming its own reward, as the insistent, nagging riff roils beautifully, occasionally flaring into strummed chords before coiling back inside its brittle shell. The history of Half Film began in 1995 when guitarist/vocalist Conor Devlin and bassist Eimer Devlin (now of [The] Caseworker) moved to San Francisco from the UK, based on their love of two bands from that city: Swell and American Music Club. There they were introduced to Jason Lakis. The trio recorded a demo in 1997, which was picked up by Buzz Records in Chicago. East of Monument, their debut album, was recorded in San Francisco over a weekend and released in spring 1998. Second album The Road to the Crater was laid to tape with Jim Putnam (of the Radar Bros) in LA, followed by a six-week European tour with Swell. After Conor and Eimer took a three-month break in Spain in February 2000, all three members decided to call it a day. And that was that. 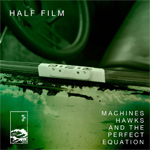 ‘Machines, Hawks and the Perfect Equation’ is available for free download from the Hidden Shoal Store. East of Monument and The Road to the Crater are released as a double CD and in digital formats on 31 October, with CD pre-orders available on 18 October.